Trainer John Moore is preparing to send out half of the 14-runner field for the Hong Kong Classic Mile at Sha Tin on Sunday (22 January), but after trackwork on Thursday morning (19 January), he had eyes for one of his seven contenders in particular. Rapper Dragon may be the highest-rated runner in the set weights affair, Eagle Way and Helene Charisma may be the Group 1 winners, but it was Beauty Generation that stole the handler’s attention after a dazzling gallop down the back straight under regular rider Zac Purton. Beauty Generation (No. 2) holds off the challenge of Western Express (outside) to win a Class 2 handicap over 1600m last start. Beauty Generation went 800m in 54.8s, covering his last 400m in a steady 26.5s but looking particularly strong through the final stages. Moore believes the gelding is right on song now for the first race of the Four-Year-Old Classic Series. “It’s going to be a great race, no doubt, but the way Beauty Generation came off the track this morning – and I had a good look at him in the light – he’s just a different horse,” Moore said about the son of Road To Rock. “He’s trimmed right up. He hasn’t lost weight, but just wait – physically, he’s wow. That’s the only way to describe him. Beauty Generation, who was G1-placed in Australia when named Montaigne, has had two starts in Hong Kong, finishing second on debut in a 1400m Class 2 handicap behind My Darling before racing to a head victory in another Class 2 handicap over the Classic Mile course and distance last time out. Two of Moore’s other big guns, Rapper Dragon and Eagle Way, had an easy time of it this morning, completing two laps of the small all-weather track at Sha Tin, with the trainer looking for a more serious hit-out tomorrow morning with both. Rapper Dragon drew gate eight, while Eagle Way will jump from six for visiting Australian rider Tommy Berry. Moore will also send out 2016 G1 Grand Prix de Paris (2400m) winner Helene Charisma for his Hong Kong debut and while he admits the colt hasn’t shown a lot in two barrier trials to date, he believes that Thursday morning’s gallop on the all-weather track – when he comfortably outworked Lotus Strikes Back over 1200m in a time of 1m 23.7s, the final 400m in 24.6s – indicates he is heading in the right direction. “Helene Charisma, we’ve got the French jockey booked for him, Alexis Badel – a good French pairing,” Moore said of the son of Air Chief Marshal, formerly named Mont Ormel. “He worked great this morning. OK, it was with a horse that’s Class 3 or 4 grade in Lotus Strikes Back and he beat him easy, but the fact was, it was confidence building. That’s all I was looking for. Helene Charisma has drawn gate four, with Rodrico (14), People’s Knight (11) and Let Us Win (one) completing the Moore septet. Tony Cruz’s four runners – Pakistan Star (nine), Super Chic (three), Winner’s Way (12) and Circuit Hassler (13) – all worked on the main dirt track, with the trainer reporting that he was “happy” with his quartet, while Danny Shum’s Seasons Bloom worked stylishly down the riverside under raceday rider Nash Rawiller, covering 800m in 56.4s with his final 400m in 26.4s. 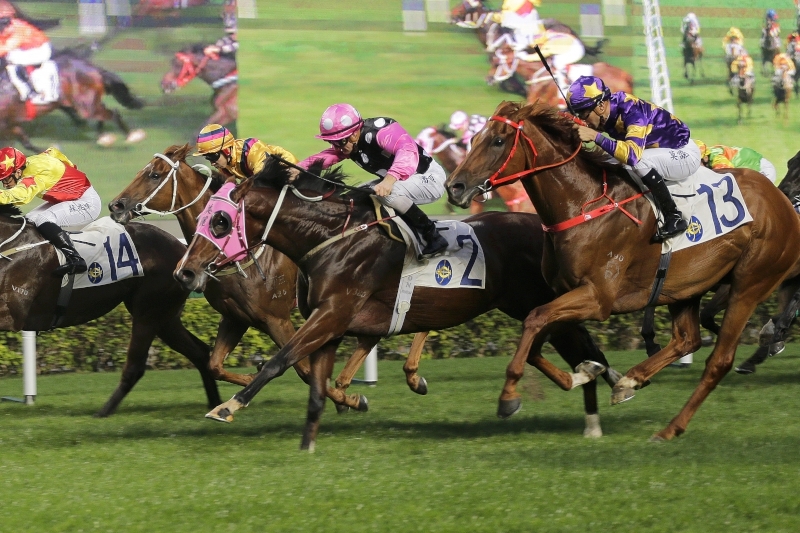 John Size-trained Western Express (seven) and Peter Ho’s Baba Mama (10) complete the Hong Kong Classic Mile field, which is set to jump as the ninth race at 5:10pm on Sunday.